All winter, we’ve watched nature lie dormant, resting. We’ve watched the light play on the dried prairie grasses, and stood in awe of the glimpses of subtle reds and bronze revealed by the sun. 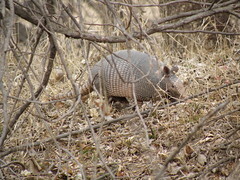 We’ve noticed holes dug in the earth by wintering animals. We’ve watched wintering birds work all day at eating. And now, Spring comes and the landscape changes and activity increases. 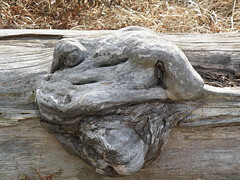 If you want to come see, go to our Turtle Rock Farm Retreat website, click on “Workshops and Retreats” and you can sign up for the Encountering the Gifts of Spring Retreat. 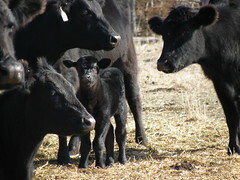 It’s Saturday, March 21, out here on the prairie in north central Oklahoma. It’s a chance to see Spring, up close. 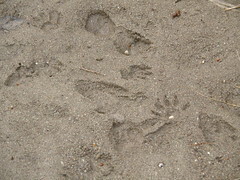 of hunting, digging for insects. And so I had the privilege of just watching. right here on the creek. the vice of sloth, acedia. is a gift to me. To watch it is a great gift. It’s hard to imagine that it’s not Spring. there are tadpoles in the creek. this first explosion of color. the coo of turtle doves. Mississippi Kites returned from winter trip. a wooden clicky sound, like castinettes. 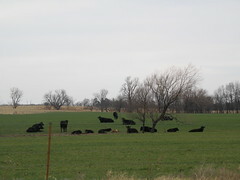 a black one in the pasture across the road this morning. raising its neck and bleating. 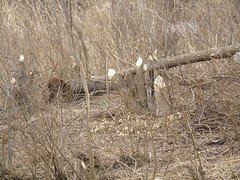 So we looked for the beaver dam. compared to two million currently. the beaver was almost extinct. and sent downstream at a slower rate. 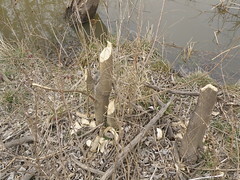 Beavers are a keystone species, for where beavers build dams the wetlands spread out behind them, providing home and food for dozens of species, from migrating ducks to moose, from fish to frogs to great blue herons. The wetlands’ underwater world does a remarkable job of cleaning the water. Not only do plantonic bacteria consume the water’s organic conaminants while trillions of tiny phyto-plankton use the inorganics to make food, but the water is cleaned by sedimentation as well. 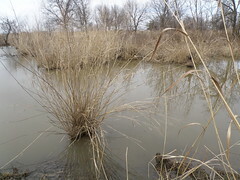 When muddy water from streams and rivers rushes into the stillness of the wetlands, the silt in the water adheres to the stalks of water plants and settles to the bottom. 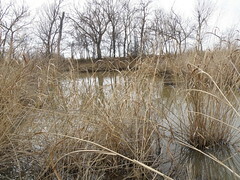 Wetlands clarify water and prevent the soil from washing downstream, and in this fashion fertile meadows build up. The area where a stream once ran becomes covered with a rich blanket of organic matter. 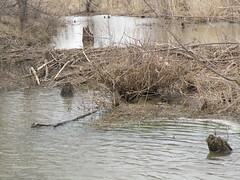 When beavers make a series of dams and ponds within a drainage basin, the water cycle in the entire watershed is affected. On one side of this creek is a lovely native grass meadow. On the other is a field of young, bright green Red Winter Wheat. as the wetland water reaches out onto the fields. to help control the release of flood waters in the rainy season. is one of those dams and reservoirs. Must we stop to consider nature’s way? Must we do what we think will make human lives better? so that all can thrive. By dredging, by damming, by channeling, by tampering with (and in some cases eliminating) the ecological niches where water cleans itself, we have simplified the pathways that water takes through the American landscape, and we have ended up with dirty water…by restoring those elements of the natural world which made the water pristine in the pre-Columbian waterways, we can have clean water once again. and I see it fly silently overhead. Each person should try hard to reserve one day out of the week to devote entirely to their practice of mindfulness…a day during which you are completely the master…Every worker in a peace or service community, no matter how urgent its work, has the right to such a day, for without it we will lose ourselves quickly in a life full of worry and action, and our responses will become increasingly useless. Picked up our Oklahoma Food Coop order last night. prepared by the good folks at Briarberry Farm in Lexington, Oklahoma. to get that granola to that bowl. grown in a field somewhere. grown in a different field somewhere. removed from the oat grain. grown in a far-away bog. from a grove of trees. to which thousands of beehives were shipped for pollination duty. Canola oil – another field. thoughtfully tended, we imagine, by a happy beekeeper. vanilla – from exotic places. and finally the bowl in my kitchen at Turtle Rock Farm. poured myself a tall glass of apple juice from Louisburg, Kansas. from a commercial-sized dairy in central Oklahoma. made cool and a bit sour by the yogurt. and I don’t remember even finishing the rest. I observe acedia flourishing…undetected and unnamed, in the postwar triumph of both weapons-making and consumer manufacturing. An unprecedented array of automobiles, dishwashers, frost-free refrigerators, and gas-powered lawn mowers were brought forth, lavishly promoted and soon regarded as necessities. The pharmaceutical industry grew exponentially to meet a need for medications that could help people cope with undercurrents of anxiety, the fear that this recent prosperity was hollow at the core. Modern conveniences might save people from tedious labor, but they could do nothing to assuage the sense of being in a precarious position in a rapidly changing world. Instead of feeling carefree, many people felt burdened with more and more ‘necessities,’ until they were less able to distinguish between needs and wants, between self-indulgence and self-respect. They became, in short, perfect consumers. It is indeed acedia’s world when we have so many choices that we grow indifferent to them even as we hunger for still more novelty…We discard real relationships in favor of virtual ones and scarcely notice that being overly concerned with the thread count of cotton sheets and the exotic ingredients of gourmet meals can render us less able to care about those who scrounge for food and have no bed but streets. How can we be acedic, you might wonder, when we are doing so much? When we are so busy? It’s not a pleasant read, for certain, but, as Norris says, we ignore our acedia at our own peril. The first step: knowing what we are doing, or aren’t doing. We can’t correct a problem we won’t face.